Ok, this is a study that can stir some debate, imho. This study from the University of Toronto’s Rotman School of Management suggests that while structure organizes human activities and help us understand the world with less effort, it also can be the killer of creativity. But there are also some elements you have to take into account before jumping to conclusions, it’s not really about learning or creativity in education as such. In three studies, the current research showed that individuals presented with a flat information structure were more creative compared to those presented with a hierarchical information structure. We define a flat information structure as a set of information that is presented without higher-order categories, and a hierarchical information structure as a set of information organized by higher-order categories. We found that the increased creativity in a flat information structure condition is due to an elevated level of cognitive flexibility. Additionally, exploratory analyses showed that participants in the flat information structure condition spent longer time on their tasks than those in the hierarchical information structure condition. Given that time spent could be a proxy for how cognitively persistent participants were on the task, this suggests that the absence of structure might also increase creativity through cognitive persistence. While most management research has supported the idea that giving structure to information makes it easier to cope with its complexity and boosts efficiency, the paper says that comes as a double-edged sword. “A hierarchically organized information structure may also have a dark side,” warns Yeun Joon Kim, a PhD student who co-authored the paper with Chen-Bo Zhong, an associate professor of organizational behaviour and human resource management at the Rotman School. 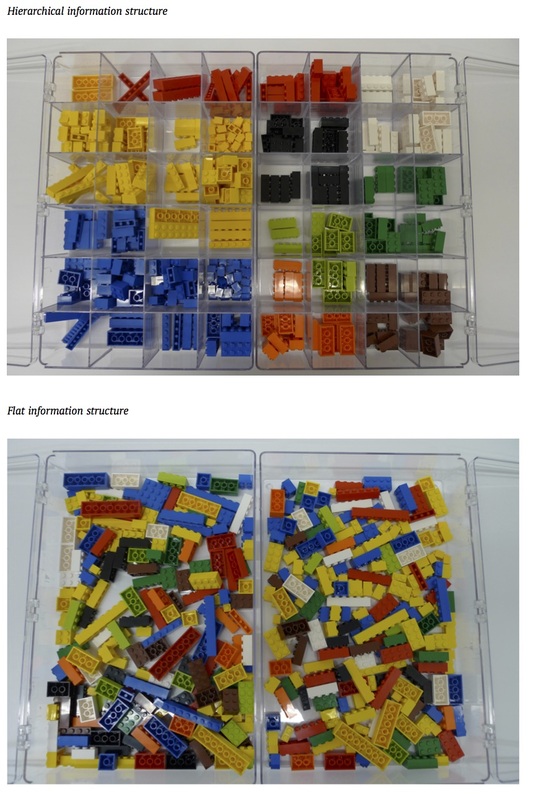 The researchers showed in a series of experiments that participants displayed less creativity and cognitive flexibility when asked to complete tasks using categorized sets of information, compared to those asked to work with items that were not ordered in any special way. Those in the organized information group also spent less time on their tasks, suggesting reduced persistence, a key ingredient for creativity. The researchers ran three experiments. In two, study participants were presented with a group of nouns that were either organized into neat categories or not, and then told to make as many sentences as they could with them. The third experiment used LEGO® bricks. Participants were asked to make an alien out of a box of bricks organized by colour and shape or, in a scenario familiar to many parents, out of a box of unorganized bricks. Participants in the organized category were prohibited from dumping the bricks out onto a table. The findings may have application for leaders of multi-disciplinary teams, which tend to show inconsistent rates of innovation, perhaps because team members may continue to organize their ideas according to functional similarity, area of their expertise, or discipline. “We suggest people put their ideas randomly on a white board and then think about some of their connections,” says Kim. Our tendency to categorize information rather than efficiency itself is what those working in creative industries need to be most on guard about, the researchers say. Ehm, ok, in that last paragraph it’s almost as the researchers suggest brainstorming, but we’ve known that brainstorming in itself is not the best way to find creative results. I do think that this study is interesting in it’s own right, but that we should be careful with the possible implications. Is structure good or bad for creativity? When it comes to organizing information, management scholars have long advocated for a hierarchical information structure (information organized around higher-order categories as opposed to a flat information structure where there is no higher-order category) to reduce complexity of information processing and increase efficiency of work. However, a hierarchical information structure can be a double-edged sword that may reduce creativity, defined as novel and useful combination of existing information. This is because a hierarchical information structure might obstruct combining information from distal conceptual categories. Thus, the current research investigates whether information structure influences creativity. We theorize that a hierarchical information structure, compared to a flat information structure, will reduce creativity because it reduces cognitive flexibility. Three experiments using a sentence construction task and a LEGO task supported our prediction. Reblogged this on kadir kozan. How many words are sufficient to recognize the author? 12 or less! Famous psychology study 'killed by replication': does a pencil in your mouth make you feel happy? Science myths: did Einstein fail his fourth grade math class? Howard Gardner on his 'multiple intelligences': the theory is no longer current! This is the blog of Pedro De Bruyckere (1974), an educational scientist. He co-wrote different books in which he debunks popular myths on GenY, GenZ, education and pop culture. Pedro is an often asked public speaker, one of his strongest points is that he is funny in explaining serious stuff.